“Baku Fashion Week” returns to the country with new fashion shows between November 19 and 22. Baku’s Kempinski Hotel will showcase the collections of both local and foreign designers including Avtandil Tskvitinidze, Gulshan Tagi, Frey Wille, Ano Kiknavelidze, Eka Balanchivadze, Leya Couture, Diamond Wedding, Ali Shahin, Deniz, Gulshan Mehtiyeva, Baron Fashion, Coo Culte, Anna Led, Narciss and others. The event will also be attended by foreign experts of fashion industry such as Darya Yadernaya, a leading business consultant in the fashion industry, Marcellous Jones , the founder of the magazine "Fashion Insider," Project’s Director Nina Drako, professional photographer Thomas Devaux, and others. Baku will also feature an exhibition by Thomas Devaux , as part of the Fashion Week from November 18 to 22. So far, the exhibition toured through France, Hong Kong, China, Russia and Serbia. Those who want to get acquainted with Darya Yadernaya have the chance to attend her lecture on November 21. Baku Fashion Week is a synthesis and fusion of oriental flavor with the world's major fashion weeks in Paris, Milan, New York and London, which gave a huge impetus to the development of the Azerbaijani fashion industry. The event is mainly aimed to reveal and promote the national designers, search for new fresh bright names in the fashion world as well as to stimulate local industry. Baku Fashion Week is held in the capital twice a year in spring/summer and fall/winter. 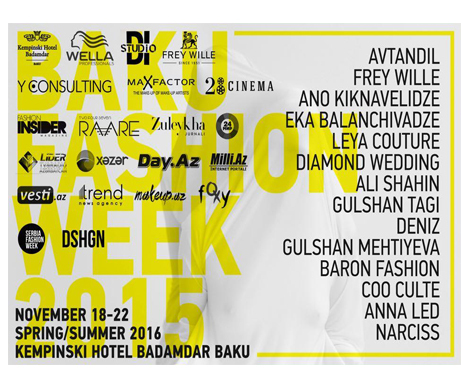 The first Baku Fashion Week was held in Azerbaijan in November 2014. The founder of the event was Hafiz Aghayev, who presented Azerbaijan at the "Mister World" contest in 2010.